The Société de transport de l'Outaouais (STO) presented the conclusions of the Study of Needs and Solutions for a Structuring Public Transit System in Gatineau's West End to the media today at a technical briefing. In general, the study recognizes the need to acquire a structuring public transit system to ensure the mobility of residents in the western part of Gatineau. Carried out in collaboration with the City of Gatineau, Quebec's MTMDET, the NCC and the City of Ottawa, the study of needs and solutions is the first stage in the project's planning. Conducted by the Roche-Genivar consortium, this study, made possible thanks to the Quebec Government $511,000 grant, was also the subject of a consultation process with citizens. Three scenarios were analysed: improving the current bus system, adding public transit measures along the Aylmer-Taché axis, and adding public transit measures along the Allumettières axis. The analysis of these scenarios shows that even if the current system is improved by preferential measures, it is still not possible to reach the minimum targets for public transit performance (travel time and efficient operation of reserved lanes), and consequently does not enable medium-term needs to be met or a significant increase in the number of people who transfer from vehicles to public transit. It is therefore essential to invest in implementing a structuring public transit system in the city's west end. The configuration in the western sector, without a central traffic axis to serve the population, makes it difficult to identify the axis to prioritize for the new public transit system. The result is that a combination of measures for the Allumettières and Aylmer/Taché axes is necessary to meet all the needs. In its cost-benefit analysis, the study showed that a bus rapid transit (BRT) system would be the preferred mode compared with a tram/light rail system. However, this mode presents a high risk of saturation in the long term, even if use of the existing bridges (Champlain, Chaudière and Portage) is optimized, larger capacity vehicles are used and preferential measures are introduced. In this context, it is our duty to take things further to identify the most suitable option for the long term because of the investments that will be required. The consultation with Gatineau residents showed that a tram/light rail system or a bus rapid transit system are both appealing modes, along with the desire for better alignment with Ottawa. The result is a broad consensus on the need to invest for public transit in Gatineau's west end regardless of whether they live in the sector. According to respondents, a tram/light rail system would be more likely to encourage non-riders to use public transit. The STO and its partners agree on the need to award an additional mandate financed by the Public Transit Infrastructure Fund to ensure that the solution chosen would enable optimal alignment with Ottawa's system, be sustainable in the long term and be part of a regional Gatineau-Ottawa vision. The mandate will also make it possible to comply with government requirements regarding the management of major public infrastructure projects. A public consultation process and information session are planned as part of the upcoming additional analysis. Until the chosen solution is implemented, because there is an immediate need to improve public transit conditions in the city's west end, the STO plans to meet rider needs by introducing preferential measures, using high-capacity buses and making ongoing adjustments to the service. The STO's chairman recognizes the value of the results of this stage and emphasizes that the context has evolved since the study began, especially with the arrival of light rail in Ottawa. It is our responsibility to examine all aspects while making sure to use a methodology that is properly suited to Gatineau's specific context. The methodology based on the MTMDET guide to establish the cost-benefit ratio excludes certain criteria such as the impact on the land value of neighbouring properties. “We are part of a metropolitan area and our economy is closely integrated with Ottawa's, which means that 40% of people go to work in Ottawa every day. To have the most efficient system for our riders, it is necessary to choose a mode that will align seamlessly with our neighbour's system, and in order to do so, we must seriously consider implementing a light rail system that is integrated with the one in the federal capital,” explained Myriam Nadeau. “I think it is our duty at the STO to take things beyond the conclusions of the study released today and to further analyse the stakes and opportunities of implementing a system that aligns better with the one in Ottawa,” added Ms. Nadeau. “A tram/light rail system must be one option examined in more detail, from the perspective of integrating the systems and the longer term vision for development of the greater Gatineau-Ottawa metropolitan area,” she specified. 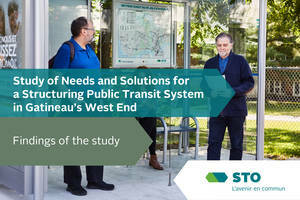 For more details on the conclusions of the Study of Needs and Solutions for a Structuring Public Transit System in Gatineau's West End and the stages to come, visit sto.ca.